Uprising by Margaret Peterson Haddix. Simon & Schuster Books for Young People, 2007. Currently Available. Face Value: I listened to this book on audio, so I didn’t have as much face time with the cover as I normally would. But this cover is pretty good – I love that the photograph images look authentic, and the factory in the background. The flames make it look a little bit like a Caroline Cooney novel – more melodrama, less historical accuracy – but no one can say its not accurate or effective. I’m more excited by this paperback edition, which I saw on goodreads, but haven’t seen in the wild anywhere. The illustration nearly always has my vote, and the simplicity of the dress form surrounded by flames is evocative and aesthetically pleasing. Does it Break the Slate? Oh, wow is this a Slatebreaking book. 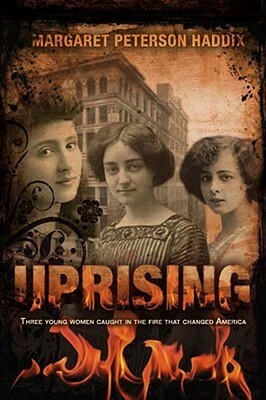 A lot of the books I’ve read about the Triangle Shirtwaist Factory tragedy, especially the fictional accounts, paint the girls as innocent victims, fallen prey to the exploitation of evil bosses. It’s not that that isn’t true in this story too – everyone who died in the fire was an innocent victim – but this account of what happened at Triangle goes so much deeper. Our story starts far before the fire, and really explores the general strike that happened at Triangle and in other factories before it, what those workers were fighting for, and why they weren’t granted their demands / what the ultimate outcome was. It addresses class privilege, workers rights, immigration, and feminism, alongside a whole host of other topics. And yet, the story is incredibly compelling. Who would we give it to? This is a gripping account of an already compelling moment in history. It would be an easy recommendation from anyone who loved American Girl or Dear America books and is ready to move on to something a little more complex. It would also be a great pairing with the nonfiction Flesh and Blood So Cheap by Albert Marrin which we reviewed on this blog last year. Review: The Triangle Shirtwaist Factory Fire is an often fictionalized topic in middle grade and YA fiction. It makes sense. For the kind of girl who seeks out historical fiction, this particular moment in history is incredibly compelling. It’s one of the few often-studied events in American history that is all about teenage girls, and it combines the thrill of freedom and independence with a devastating tragedy. Both in childhood and as an adult, I’ve read a lot of these stories, and I can definitely say that Uprising is one of the best. 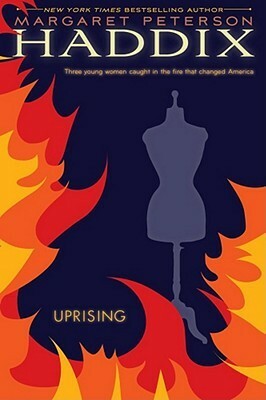 The story of Uprising follows three girls on their very different journeys to find independence, through alternating chapters. Bella’s story begins with her arrival in the United States from Italy, naïve and helpless. She starts the book completely dependent on others, and falls victim to exploitation by her landlord and her bosses. But when the worst thing she can imagine happens, she ultimately begins to find her own strength. Yetta is also an immigrant, from Russia, but she already thinks of herself as an American. She and her sister are both deeply invested in the union, and the promise of equality and a better life that the United States offer them, and she believes in her cause more than she believes in anything. Jane, on the other hand, is an American, and a privileged one. The daughter of a wealthy business owner, she is struggling against how caged and useless she feels as she grows up. When she becomes involved in the strike (as many wealthy women did), it changes her forever. Eventually, of course, our three girls lives become intertwined, though I appreciate how long Haddix takes her time getting there. In theory, these girls start the story in very different places, and I was surprised by how believable it was as all of their narratives all came together. This is very much a feminist book. Haddix is very clear on that point, painting the labor strike as a feminist issue. Notice is taken of the fact that their strike is considered particularly ineffective because bosses are unwilling to take women workers seriously. Attention is paid to the fact that if women could vote, conditions for workers would be fairer. All three of our girls fight hard for their rights as workers and as women, and the scene where the three of them attend a suffrage rally is particularly inspiring. This is a book about what it meant to be a woman at the turn of the century, and how women fought to be recognized as equal human beings across class lines. However, this is not in any way a book about how class or status doesn’t matter because women are equal, or anything reductive like that. Through Jane’s character, Haddix sharply analyzes the difference in the women’s rights movement across class divides. Poverty, she suggests, is also a feminist issue. Additionally, a lot of the fictionalized books I’ve read about Triangle spend a lot more time talking about the fire than they do about the strike. This book is much more about the strike, and about what the strike meant for women, both on the large scale and in the particular with our protagonists. The point then becomes, not simply that this was an awful tragedy in which women were victimized, but about the fact that the very things the women at Triangle were fighting for could have prevented the fire from being the disaster it was. There’s no surprise ending where the characters we love all survive either. We know from the very first chapter that only one of our protagonists is going to make it out of the fire alive, and those final chapters where we find out what happens to them is painfully well realized and devastating. It’s hard to read about beloved characters dying, of course, but it’s also necessary in a book like this one about a tragedy of this magnitude. Each of the girls’ journeys is an important one, and collectively they tell a feminist story about how young girls helped to change this country for the better. From a historical perspective, what could possibly be more Slatebreaking than that? This entry was posted in Reviews, Young Adult and tagged Civil Rights, Feminism, Historical Fiction, Immigration, Labor, Triangle Shirtwaist Factory, Unions. Bookmark the permalink. Most of my interest in history has focused on my home country, Canada, so I have never heard about the Triangle Shirtwaist Factory but this book sounds great, especially how it really uses a feminist lens to present the story and delve into it’s complexities. I’ll off to add this one to my TBR list – thanks for turning me on to an important moment in history and a great sounding book! I can’t think of any right now due to jet lag except a local author who writes middle grade fiction that I enjoyed when I was younger – Connie Brummel Crook. I believe I read Flight & Meyer’s Creek, one of the Nellie McClung books and the Hungry Years, but she has many others and most feature female protagonists.